There’s a cool new Web tool called SimilarTech that we checked out recently to see the top online recruitment software solutions being used around the world. 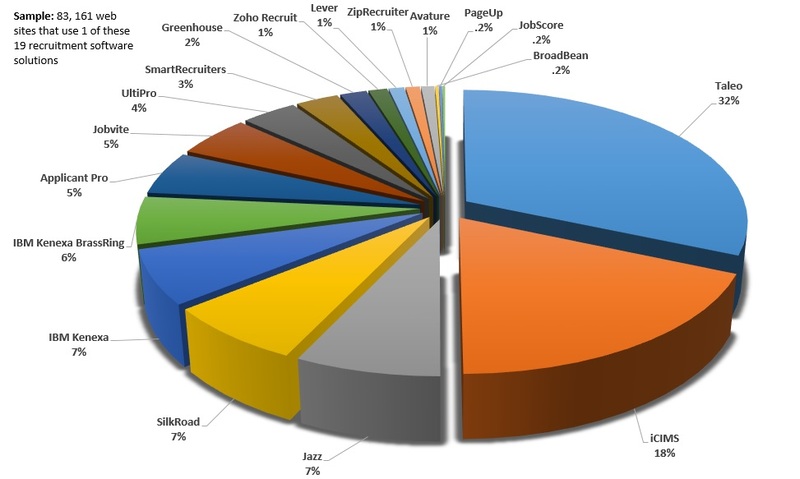 There are 83,161 Web sites using one of the 19 recruitment software solutions below. This list is similar to the The Top 100 ATS list we put out recently though it is shorter and includes a few non- ATS solutions such as ZipRecruiter, Avature and PageUp. Source & Criteria: This list of recruitment software is sourced by SimilarTech which analyzes top recruitment software based on # of web sites using the software. This includes software that automates the recruitment process such as posting jobs to interviewing to onboarding to performance assessment) and code for the recruitment software must appear on the client’s Web site in order to be tracked. Some recruitment software solutions, such as LinkedIn Recruiter, are not included because you can not track which clients use it because LinkedIn’s clients do not have to put the LI Recruiter code on their Web sites. The list is for online recruitment software only and would not include a recruitment tool that is installed just on your hard drive. The only recruitment software solution on the list we hadn’t heard of previously is PageUp which is a talent management software that appears to have a strong presence with employers in Australia. Ping us for an opinion on what you think the top recruitment software is. We know our list of recruitment software is just scratching the surface of great recruiting software vendors –If you represent or use a tool that is not mentioned above please add a comment below about it and include the uniqueness of it (e.g. what type of customer is it best for, does it focus on particular geographies, how many employers use it, etc.?). Thanks. You might also want to check out a list of 2018 Top Applicant Tracking Systems HERE.